All businesses need basic services such as e-mail hosting, document sharing, and file editing. The ways to set up these functions vary greatly, however--pick the wrong method, and you'll waste time and money. For example, you don't need to cover the costs of your own server, since the various Google Apps for businesses shift these tools into the cloud. Plus, the online approach makes your organization more mobile, since it allows you and your staff to connect from any computer and from most smartphones. Google's offerings for businesses differ from the company's consumer applications. But that's just the beginning. In this article I'll reveal tips and tweaks that can supercharge Google's tools to improve your business's productivity. Whether you are just beginning to explore Google Apps or are already a subscriber, these tricks will help you get the most from the services. In addition to handling your e-mail, Google Apps can help people in your business collaborate. Many tools are available, covering everything from scheduling to document creation to videoconferencing. And though you save everything in the cloud, Google maintains good security to protect your data. Google Calendar can help you keep appointments and share scheduling with groups. The business service is similar to the consumer version, but oriented toward clusters of employees. You'll be able to share workday details with coworkers so that they know when you're free for a possible meeting, for instance. The tool can send meeting invitations and update itself as recipients verify their attendance. Google Docs imports and edits basic office-suite files, including .doc, .ppt, and .xls files in its word processor, presentation tool, and spreadsheet app, respectively. Multiple staffers can share documents, each person editing them without worrying about losing someone else's changes (as they might when downloading and uploading documents to a file server). Google keeps a complete history of each contributor's updates, and colleagues can even edit files at the same time. This setup can serve as a great group note-taking space for a conference call or during a presentation. Google Sites, available in each edition of Google Apps, acts as an intranet Website. You can use it as a company bulletin board for everyone, store HR policies, highlight an upcoming event, or otherwise organize information. Google Sites and Google Docs can store any document type, so you can use them for simple file sharing, too. Enter your domain to begin, or Google can secure a name for you. Google Groups, available in the Premier Edition, acts as a center point for collaboration. Groups allow staffers to send messages within mailing lists at your company, such as a sales-team list. In addition, members can share a calendar and documents as a group. When new people join the group, they gain access to the message history as well as to the rest of the information, so that they can get up to speed with in-progress plans. Google Video, another Premier-only service, is essentially your company's own version of YouTube. You can post private, internal videos for training, collaboration, or any other use. The tool also hosts your public videos, eliminating another subscription or service that you might need. The main difference between consumer Gmail and the version available through Google Apps is easy to spot: custom domain names. Instead of an @gmail.com address, you get @yourbusinessname.com, which makes a major difference in your branding, even if you operate a sole proprietorship. I know I always assume that bob@bobsmithconstruction.com (or even @bobsmith.com) represents a more established business than does bobsmith@gmail.com. Click 'Activate email' to configure your MX records so that Google can host your messages. If you already own a domain name, such as for your Website and current e-mail, you'll point its MX records to Google. Essentially, when computers contact your domain registrar to locate your mail server, the MX record creates a forwarding address to Google so that mail still flows properly to you. 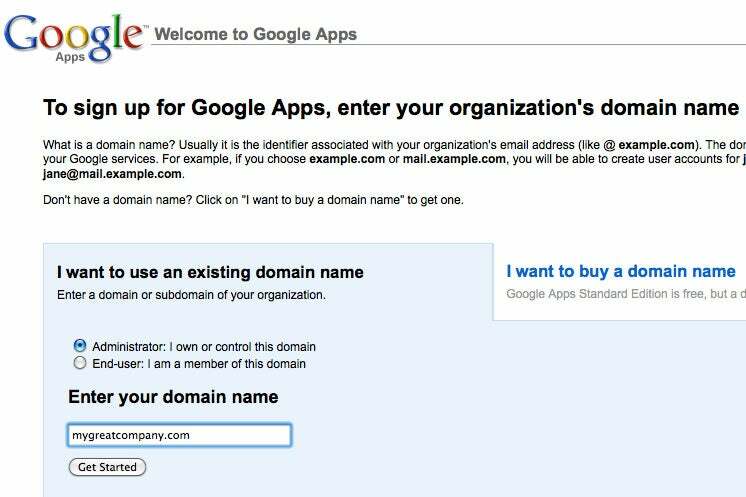 If you don't own a domain name yet, Google can register one for $10 a year, configuring it automatically. 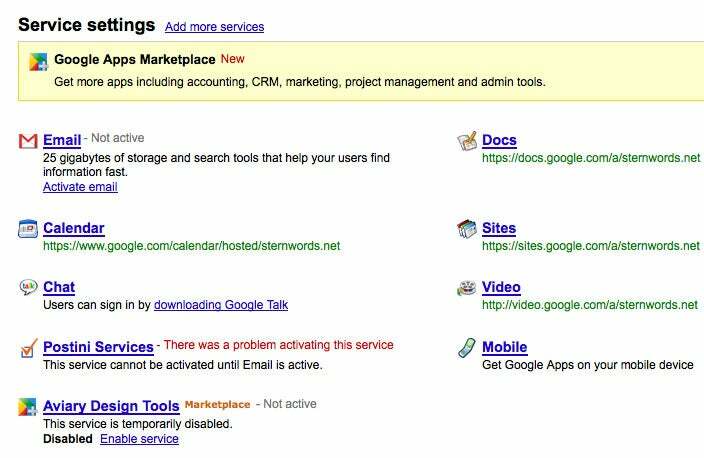 Small businesses might be content with the free Standard Edition of Google Apps. It supports up to 50 e-mail addresses, each with 7.4GB of storage space. Each e-mail address can send messages to 500 different recipients each day. Unless your business has a wide volume of daily contacts, those limits should be fine. But like consumer Gmail, this mail service includes ads, which might be a reason to move up. The paid, $50-per-year-per-user Premier Edition eliminates ads and increases those limits. Each address can send to 2000 recipients per day, and you get 25GB of storage per e-mail address. With the paid or free version, you can share contacts within your company, pooling resources from Web-based or mobile Google Apps.